In a shallow bakign dish or large zip top plastic freezer bag, combine red wine, hickory smoked marinade, and olive oil; add meat, and toss to coat. Cover or seal, and chill for 1 hour. Let meat stand at room temperature for 30 minutes. Remove meat from marinade, discarding marinade. Thread meat and vegetables alternately onto skewers. Sprinkle kabobs evenly with salt and pepper. Spray grill rack with nonstick nonflammable cooking spray. Preheat grill to high heat (400 degree to 450 degree). 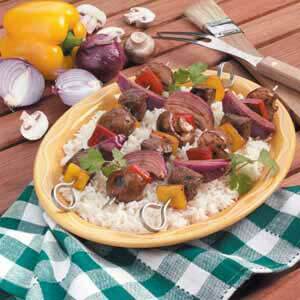 Grill kabobs, covered with grill lid, for 5 to 6 minutes on each side, or to desired degree of doneness. End.